It’s been a long time since I wrote about anything research-related. Well, that’s because research is hard! The science is happening slowly but surely. In the meantime, something vaguely related to my research popped up on the NASA website: ice on Mars! Many people have heard about water on Mars. Recently, liquid water has been in the news because of the “Recurring Slope Linea,” or streaks of wet sand observed by spacecraft orbiting the planet. These suggest that there is liquid water (laced with some kind of antifreeze, like salts) flowing on modern Mars. But we also know that Mars has had much more water on its surface: enough, in fact, to carve massive “valley networks” early in Mars’ history. The valley networks, an example of which is shown below, are still an area of debate in the scientific community. How did they form? Did Mars once have rainfall? Did groundwater seep to the surface, coalescing into channels protected by a thick layer of ice? A valley network on Mars, showing that liquid water once flowed in abundance on (or near) the surface. This image is about 200 kilometers across. Whether or not liquid water flows on Mars today, we do know that the planet has plenty of ice – both water ice and “dry ice,” or frozen CO2. Yes, it gets so cold on Mars that CO2 snow falls! Mars has two polar ice caps, both of which can be seen from Earth with the aid of a telescope. In the summer, Mars’ polar caps are predominantly water ice. In winter, CO2 snowfall blankets the surface. One of my fellow graduate students mapped an area around the south polar cap, called the Dorsa Argentea formation, and found many signs not just of ancient glaciers, but of their melting. This is important, because glaciers on Mars today are “cold-based.” That is, even the very bottom of the glacier is well below freezing, and the ice is frozen to the rock below. On Earth, most glaciers are “wet-based” and their base is at the melting point of ice (0 degrees Celsius). The major exception to this is Antarctica, where planetary scientists often go to explore a Mars-like environment. Though there are competing hypotheses for why glacial melting could have occurred on Mars, the presence of liquid – a lot of it, based on the observed glacial landforms – suggests a long-lived environment in which nascent Martian life could have survived. The type of life that might have survived under these conditions is an interesting subject in itself; check out “tardigrades” (a.k.a. water bears)! Could this little guy, known as a tardigrade, live on Mars? Climate therefore becomes an overarching theme of ice on Mars. How did the ice form? Did it melt? Where did it go? What does this mean for the climate on Mars, and whether the planet could have supported life? We use ice to answer similar questions on Earth. Ice cores, drilled from glaciers and ice sheets around the world, contain records of the climate in which each layer of ice formed. Cores are expensive and difficult to obtain, however, and represent only one point in a massive ice sheet. 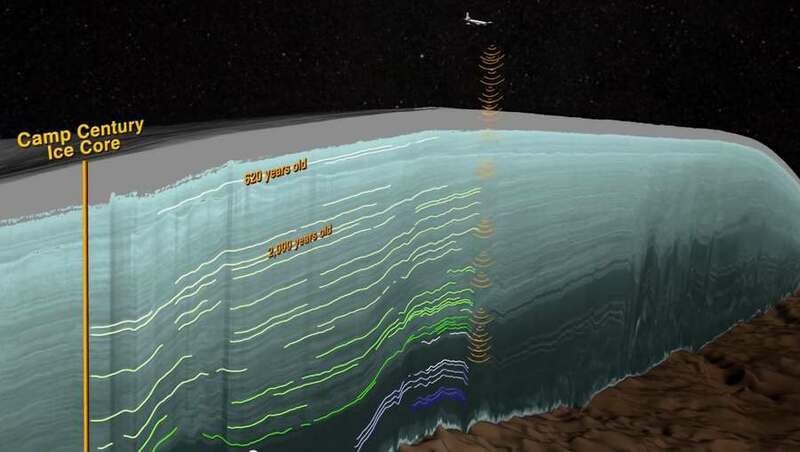 To track these climate-induced layers throughout the ice sheet, researchers sometimes use ice-penetrating radar. An airplane flies over the ice sheet in a straight line, sending out radar pulses and collecting the returns as it goes. The waves bounce off of layers in the ice, with some layers reflecting more strongly than others. These strong reflections, which can be tied to individual layers in an ice core, can be traced for many miles within the ice! In this way, the combination of ice cores and radar data allow us to explore the records of Earth’s climate locked away in glaciers and ice sheets. Recently, planetary scientists have traced similar layers in Mars’ polar caps using radar from the Mars Reconnaissance Orbiter (MRO) spacecraft. Unfortunately, we don’t have ice cores (yet!) to calibrate these radar reflections with, but the data can be used to draw conclusions about major features of the ice caps. For instance, the north polar cap appears to be divided into two sections. The upper layers in the ice, above what seems to be a major erosional surface, seem to have accumulated rapidly and regularly compared to the ice below. The period of erosion at the base of the upper layers reflects a time when the climate at Mars’ north pole was warmer than it is today. Planetary scientists believe this could have occurred when Mars’ polar tilt, called “obliquity,” increased. Obliquity, or axial tilt, of a planet. Mars’ obliquity is thought to vary from 0-60 degrees! At periods of “high obliquity,” when Mars’ north pole was tilted us much as 60 degrees from vertical, the poles become much warmer. This causes ice to move away from the poles and shift to lower latitudes – i.e., a period of erosion of the polar ice! When the obliquity lowers, moving the poles back toward vertical, ice shifts back to the poles. This idea is consistent with the ice layering seen by MRO. Thus, scientists are exploring Mars’ climate history with a spacecraft! Layering in Mars’ polar ice as observed by the Mars Reconnaissance Orbiter (MRO). Now we just need some ice cores to figure out what all of the layering in Mars’ polar ice means in terms of dust content, chemistry, and snow texture. For the record: I have volunteered for that field work.